This countryside is not a big attraction but can be visited when holidaying in Fuerteventura for the delicacies like sauces, jams and cheese, local Craft ware and Aloe Vera. From amazing flowers, abundant plants to marvelous scenery, this attraction is worth paying a visit. Betancuria - Capital of Fuerteventura, this part of the island is really small, but has remarkable archeological and history rich structures and museums, for those interesting holiday in Fuerteventura. This tourist attraction is spread across the area of 50000 square metre and also supports a botanical garden, as well as a zoo. Tourists and visitors can also enjoy their holiday in Fuerteventura, with the amazing camel safari and stunning views from up hills. El Museo de La Alcogida is an open-air museum presenting the essence of rural and rustic village culture and life. The show puts forward humble and self effacing farmers, craftsmen and houses of old times, worth making it a superb tourist attraction. The museum can also be visited for experiencing the low-ceilinged and shady café-bar, when on a holiday in Fuerteventura. This picture perfect restaurant surrounded with parasols, laurel trees, bougainvillea, and cactus garden and citrus trees. This restaurant is a tourist attraction in itself as it helps tourist and visitors unwind, when on holidaying in Fuerteventura. Some of the delicacy you can relish in this place include home made cakes and wines, Lanzarote smoke salmon and sizzling pork fillet. Best way to enjoy a great holiday in Fuerteventura is to have its local cuisine. 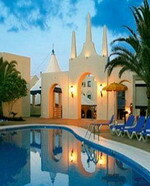 This tourist attraction is a natural reserve and is quite admired by tourist and visitors holidaying in Fuerteventura. Many people simply visit this reserve for tranquility, abundance of natural beauty, peace of mind and lots of recreation. 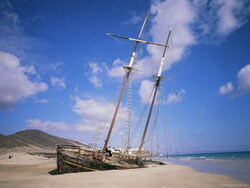 The easy way to reach this attraction is via a boat ride from the land of Corralejo. Islote de Lobos does not just offers freshness and calmness, but also has breathtaking views to capture. Located at the eastern coastal rural community of La Lajita, this zoo is perfect way to enjoy family time when holidaying in Fuerteventura. From small animals, camel safaris, horse rides, a parrot show, palm trees to a beautiful bar, this tourist attraction offers a lot. It is believed that the best time for a holiday in Fuerteventura is between November and February, because of less heat and not much rain. Costa Antigua is situated some two kilometres north of Caleta de Fuste on the east coast of Fuerteventura, about ten miles from the airport. 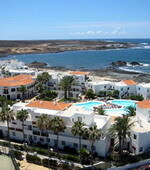 It is a mainly residential area with a few hotels, and is much quieter than Caleta de Fuste. There are a number of bars and restaurants and the neighbouring resort can be easily reached by taxi or bus. The Barcelo Puerto Castillo is a modern low-rise partment complex, which encircles a swimming pool and is located 50 metres from the sandy beach of Caleta de Fuste. All apartments are equipped with sofabeds, safes, satellite television and telephones. At the Club el Castillo, hungry travellers can choose from two restaurants, three snack bars, a pizzeria and a creperie. The Puerto Castillo houses its own outdoor pool; three further pools and two children's pools are available at the Club el Castillo and kids can also enjoy use of the mini club. For those who like to be pampered, the Thalassotherapy Centre in the adjacent Barcelo Fuertaventura offers a variety of treatments including algae based therapies, hydro massage beds, Turkish baths and relaxing massages. There is plenty to do nearby, with Caleta de Fuste beach, diving opportunities, and the Fuerteventura Golf Club, all within 5 kilometres of the hotel. Fuerteventura Airport is approximately seven kilometres and a 10-minute drive away. The Hotel Elba Calota is located in the island of Fuerteventura, Spain, facing a private sandy beach in one direction and the island's only 18-hole golf course in the other. The hotel was completed in 2007 and has extensive landscaped grounds leading to the beach and a series of freshwater swimming lakes connected by a stream. The Hotel Elba Calorta has a restaurant on the terrace facing the sea which serves lunch and dinner al fresco. There is also an indoor buffet restaurant where a complimentary buffet breakfast is served. A swim-up poolside bar serves drinks and light snacks, while the indoor bar specialises in cocktails. The 346 air-conditioned guestrooms all have balconies, most with sea views. The Hotel Elba Palace Golf is a modern hotel inspired by traditional Canarian architecture, set facing the sea in the Fuerteventura Golf Course, 13 kilometres down the coast from the capital, Puerto del Rosario. Guests can enjoy a dip in the heated, freeform outdoor pool, and a separate kids' pool is provided for younger guests. Cool drinks and snacks are available from the poolside bar. Those seeking relaxation can head to the health club for a workout in the fitness room. Hoyo 19 offers a buffet of hot and cold dishes and an à la carte Canarian menu, and opens onto a terrace with views over the golf course. The St Andrews restaurant serves traditional fare accompanied by a wide selection of national and international wines. This two-floor property features 61 traditional guestrooms with polished wood floors, wooden furnishings, fine fabrics and ceiling fans. 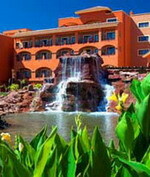 The contemporary Sheraton Fuerteventura Beach, Golf & Spa Resort, with its grand pillared entrance hall, is surrounded by gardens featuring waterfalls and palm trees, and is located directly opposite the beach. The hotel is well placed to explore the surrounding area; the beach is just 10 metres away and there is a golf course 500 metres away. Guests can choose between four restaurants: Mojo Picon offers a selection of Mediterranean and international food in a buffet-style; Wok-N-Zen is an oriental restaurant serving Asian food; El Asadero serves a selection of seafood in a nautical-style setting with outside seating, and La Veranda offers typical Italian specialities. The 266 guestrooms, over four floors, feature light decor, patterned fabrics and dark wood furnishings. All offer balconies with sea views. Caleta de Fuste / Costa Caleta is the largest community in the municipality of Antigua, Las Palmas, Spain on the island of Fuerteventura in the Canary Islands. Caleta de Fuste / Costa Caleta is host to a variety of tourists and has numerous hotels, shops, boutiques, bars, cafes, and restaurants on or near the beaches. The area is centered on a castle in the main harbour. The castle was built as a martello tower by the military engineer Claudio de Lisne in 1743. Local recreation includes sailing, diving, windsurfing, scuba exploration, and simple beachgoing. The ocean waters in the area are known for their dolphin and turtle populations. A weekly trade fair is known for having some of the best deals on leather goods anywhere. Nearby to Caleta de Fueste / Costa Caleta is the Championship golf course, one of two at Fuerteventura and home to the Spanish Open in 2004. The second golf course is right next to the first, finished in 2007. 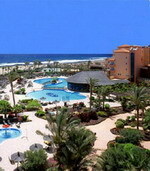 Barcelo Fuerteventura is located in Fustes, Fuerteventura, adjacent to the beach and two kilometres from the Salinas de Antigua and Fuerteventura golf clubs. This beachfront resort hotel is air-conditioned throughout and has an outdoor swimming pool as well as a Thalassotherapy centre, a solarium, and a sauna. Barcelo Fuerteventura has two restaurants and a bar and guests receive a complimentary breakfast every morning. There are two golf courses within two kilometres of the hotel and a range of onsite activities is available including archery, water polo, and billiards. The hotel's 462 guestrooms extend to balconies or terraces and have complimentary Internet access and satellite television. Further amenities include minibars and telephones. The Genarios Suites is a modern apartment complex encircling a swimming pool in the resort of Antigua, situated adjacent to the sandy beach of Caleta de Fuste. Guests can visit the spa centre to relax in the sauna and steam room, soak in the hot tub and enjoy a range of beauty treatments. Sun-worshippers can lounge on the terraces with cocktails from one of the poolside bars. There are three swimming pools, including one for children, and an indoor pool. For those feeling energetic there is a fully-equipped fitness centre with an aerobics dance studio. Guests can enjoy a variety of dining options including Italian dishes in the pizzeria, al a carte in the restaurant, or buffet style in the Geranios International buffet. This three-floor hotel features 223 contemporary apartments, all of which have bright decor and open onto balconies. 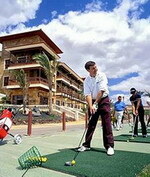 The Hotel is located in the Fuerteventura Golf Club development, in the municipality of Antigua, overlooking the beach and next to the 18-hole golf course. For those who enjoy walking by the sea, there is a magnificent promenade with wonderful views next to the hotel. You can start the morning with an assorted, carefully made buffet breakfast, which is served at the hotel restaurant on the open-air terrace that offers magnificent views of the Atlantic Ocean. Golf is of great importance to the Elba Sara Hotel. The hotel has a mini golf course with 18 holes that runs through lakes and water resorts by the beach, as well as the first Golf Course on the island, Fuerteventura Golf Club, which was designed by the famous architect Juan Caterineau. 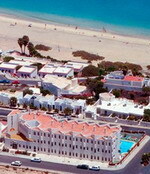 Corralejo is approximately 2 miles (3.2 km) square, making it the largest holiday resort on the island. At its centre Corralejo remains a traditional fishing village. However, there are many new buildings behind and to the side of the town. Along the waterfront there is a promenade that is lined with cafes and restaurants. From the port there is a regular ferry service to Lanzarote. The beaches in Corralejo are the resort's major attraction. The area has 7 miles (11 km) of fine sand starting 2 miles (3.2 km) outside of Corralejo, along with some smaller bays along the coast. In addition, there are several miles of sand dunes located nearby, which have been designated as a nature reserve. The waters around Corralejo are clear and an intense shade of blue, but are affected by strong currents. The town's beaches are somewhat more sheltered and have a band of volcanic rock along the shoreline. Have an unforgettable experience at Hesperia Bristol Playa. Located in Correlejo, on the island of Fuerteventura in the Gran Canary Islands, guest can expect to have good times and memories. Hesperia Bristol Playa is located on the seafront, giving guests the luxury of strolling along sandy beaches and appreciating the beauty of sparkling turquoise waters. Bristol Playa offers fantastic amenities to ensure a comfortable, fun stay. Three outdoor swimming pools are located on site to accommodate families and individual guests. Enjoy a supermarket, a bar, a garden bar, a tennis court, landscaped gardens, a pool table, on site security and more. One-bedroom apartments feature all the amenities need to have a guest- friendly experience. These apartments are centered round a large outdoor swimming pool surrounded with a sun terrace. Here guests can recline on lounge chairs under parasols with a cool drink from the bar. There is a separate, smaller, pool for children. Guests can work out at the fitness room, or indulge themselves with a massage before unwinding in the sauna. There are also squash courts on site (surcharge). The Restaurant Playa Park, located on-site, offers international dishes and Spanish and Canarian specialties served in this relaxed al a carte and buffet restaurant. This two-floor property features 141 apartments equipped with kitchenettes, all of which include satellite TV, telephones, and safes. The Dunas Club is located in Corralejo, Fuerteventura, 750 metres from the beach. Baku water park is one kilometre away, and La Oliva is 15 kilometres from the hotel. This hotel has a whitewashed exterior and offers an outdoor swimming pool next to a tiled terrace area decorated in earthy tones. There is also a billiards table on site. The onsite buffet restaurant at the Dunas Club serves breakfast (complimentary) and dinner, and the poolside bar offers a selection of drinks. A half-board option is offered. Bicycle rentals can be arranged by the hotel, and there are squash facilities on site. The modern guestrooms extend to balconies and include kitchenettes with tea and coffee makers, refrigerators, and microwaves. The Suite - Hotel Atlantis Fuerteventura Resort is located in one of the most beautiful areas of the island, close to the National Park of the Dunes of Corralejo. Throughout the year, visitors from around the world come to the island in search of the paradise of crystal clear waters and pure fresh air. 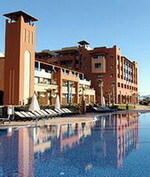 The resort contains 7 swimming pools, some of which are acclimatized from November to April. Feel “Wellbeing” in our Atlantis Spa and discover the balance between body, mind and spirit, a synergy between desires and needs. The resort has plenty of restaurants and bars to suit everyone. With the little ones in mind, we have designed an entertaining programme of animation for all children. Costa Calma (Spanish for calm coast) is a village that is used as a holiday resort in the Canarian island of Fuerteventura. Costa Calma is located in the beginning of the Jandía peninsula in the southern part of the island. 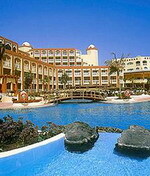 Costa Calma is a tourist community which brought tourism in the 1970s and created famous hotels. It also brought in restaurants as well as businesses which brought economic development to the vicinity of Costa Calma. Also a park exists today, from the clear waters of the hotel, and the flora of the area are listed as endangered species. The only site of interest is the beach near Costa Calma called Playa Sotavento, which stretches about 50 km from the south up to the point of the island. The windsurfing championships are held in Costa Calma. The Aparthotel Morasol is a modern, Mediterranean-style apartment complex, situated just 125 metres from the wide, sandy beaches of Fuerteventura's Costa Calma. The beach is just opposite the hotel and stretches 25 kilometres along the south coast of the island. Guests who enjoy walking can take a two-hour hike along the coast to the wild and romantic west coast. The hotel's Restaurant Morasol serves international dishes, and is open daily for breakfast, lunch and dinner. Guests can take a refreshing dip in the outdoor pool, bronze on the terraces, and sip drinks from the poolside bar, while kids have a separate paddling pool. This four-floor property features 42 simply furnished, traditional apartments with whitewashed walls, tiled floors and painted wood furnishings. Rio Calma Hotel is located by the sea, one kilometre from the town of Costa Calma on the island of Fuertaventura, one of the Spanish Canary Islands. Set in lush, semi-tropical gardens, this six-storey resort hotel features an outdoor pool with a fountain feature and a poolside bar, and has direct access to the beach. The hotel has a kids' club plus a children's swimming pool, and there is a full service health spa with a sauna and beauty and massage treatments available. Restaurant Rosa James serves regional specialities and international dishes in a contemporary setting. A complimentary breakfast is served daily, and the half-board room rate includes breakfast and dinner. The 384 guestrooms have light decor, modern furnishings and balconies. Set among palm trees and lawns in the resort of Costa Calma, the Sunrise Costa Calma Palace offers sweeping sea views just two kilometers from the white sands of Sotavento Beach. A Thalassotherapy Center offers a sauna, steam room, spa tub, beauty treatments, and massages. There are three swimming pools, including one for children, and a poolside bar. Other recreation options include tennis, miniature golf, and a fitness center. European cuisine is served buffet-style in the dining room, and guests enjoy live entertainment in the evenings. The 412 air-conditioned guestrooms have balconies and bathrooms with bidets, complimentary toiletries, and makeup mirrors. Jandia - The Jandia peninsula is a nature reserve separated from the rest of the island and bordered almost completely by vast beaches of white sand. A large sandy fringe of some 20 kilometers in length and more than one kilometer wide in some areas, is the site of two tourist resorts: Costa Calma (above), near the unequaled Playa de Sotavento, and Morro Jable. Along this massive stretch of beach you'll also find many resorts, bars and water sports areas. The Barcelo Jandia Mar is an All-Inclusive resort set 600 metres from Jandia Beach on the south of Fuerteventura island, two kilometres from the resort of Morro Jable. The resort is set in within the second largest golf course on the island, and the resort of Morro Jable is just two kilometres away. Further afield, Costa Calma and the long sandy beach of Playa Barca are 30 kilometres away. The hotel has three restaurants and six bars offering buffet and a la carte dining, snacks, and drinks throughout the day. A bridge spans the four freeform swimming pools, connecting the terraces where guests will find sun beds and parasols. Guests can keep refreshed with drinks and snacks from the poolside snack bar and enjoy activities and entertainment day and night including evening shows, live music and step-aerobics, aqua gym classes, stretching and dance classes. Pájara- in Costa Calma - this area of Fuerteventura has the greatest length of coastline in all of Spain, and much of the coastline consists of beaches of fine white sand. For this reason there is a wealth of watersports activity, and the world windsurfing championships are held here each year. The town is very picturesque and well worth a visit. The four star Hotel H10 Playa Esmeralda, decorated in the traditional terracotta and white of the region, is set in extensive grounds with excellent views over the adjacent 25 kilometer-long Sotavento beach. 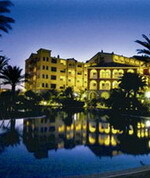 The hotel is part of the Costa Calma resort, but at two kilometres from the bustling center, is peaceful and quiet. A large landscaped swimming pool, open-air jetted tub, games room, sauna and massage services, tennis and table tennis are just some of the activities on offer. A nightclub and a separate indoor swimming pool are further features that make this hotel stand out from the crowd. There are two dining options: the Restaurant Jandia provides buffet-style eating, while the Bar Restaurante Maxorata offers lunch on the outside terrace next to the pool. 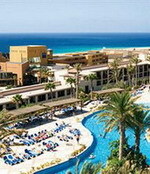 The Melia Gorriones is a modern hotel surrounded by sand dunes and palm trees, set on the beach of Playa de Sotavento. The hotel is well placed for exploring the surrounding area; the town of Costa Calma is four kilometres away, and the marina at Morro Jable is 20 kilometres away. The hotel's restaurant Los Gorriones offers hot and cold buffets for breakfast and dinner, in light modern surroundings with high ceilings and columns. Guests can also enjoy a selection of snacks and set meals at the Oasis Snack Bar overlooking the pool. The full-service health spa offers Turkish baths, massages, beauty treatments, and a sauna and hot tub. Guests can also practise serves on the tennis and volleyball courts, swim in three swimming pools, and sign-up for lessons at the onsite diving and windsurfing schools. Children can enjoy the miniclub, playground and kids' pool, and there is evening entertainment, including live music and shows.